Ever since Formula One adopted what fans lovingly dubbed the “Verstappen Rule” mandating more experience and a minimum age for drivers to receive an F1 superlicense, there has been one lingering question: what on earth is a Formula Two? Now we know: the GP2 series will be rebranding itself as Formula Two, reports Motorsport.com—which was what most of us expected anyway. The ex-GP2 series is, of course, a significant step down from the F1 big league it supports. Perhaps the most famous recent reference to GP2 was thanks to F1 driver Fernando Alonso, whose McLaren F1 car’s Honda power unit was running so poorly, he called it a “GP2 engine” repeatedly on air. 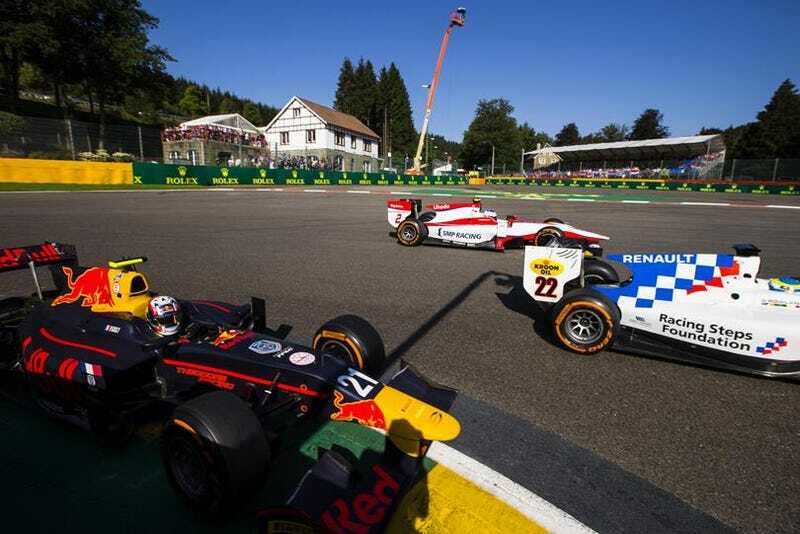 The series formerly known as GP2 is considered to be the highest level of the single-seater ladder series that feed into F1. Many recent F1 stars came out of it, including everyone from F1 world champions Nico Rosberg and Lewis Hamilton to Le Mans winner Nico Hülkenberg all the way to repair shop favorite Pastor Maldonado. However, being the oddball named “GP2" in the motorsports ladder was always a bit awkward, and FIA president Jean Todt wanted to get a clearer progression for single-seater racing, pushing to have a clear path from Formula 4 into Formula 3 and then Formula 2 before racers reach Formula One. The sale of F1 is believed to have smoothed things out for the FIA Single Seater Commission to come to an agreement with GP2 to rebrand itself “F2,” reports Motorsport.com. If we had to guess, we’re going to say that the change to more forward-thinking leadership was a huge plus in making this deal. We’re sorry, Fernando. Your car is still terrible this year, and you’re going to have to call it something else when you’re mad. “Formula Two” has a nice ring to it, though. We’re sorry about your Formula Two car, buddy.